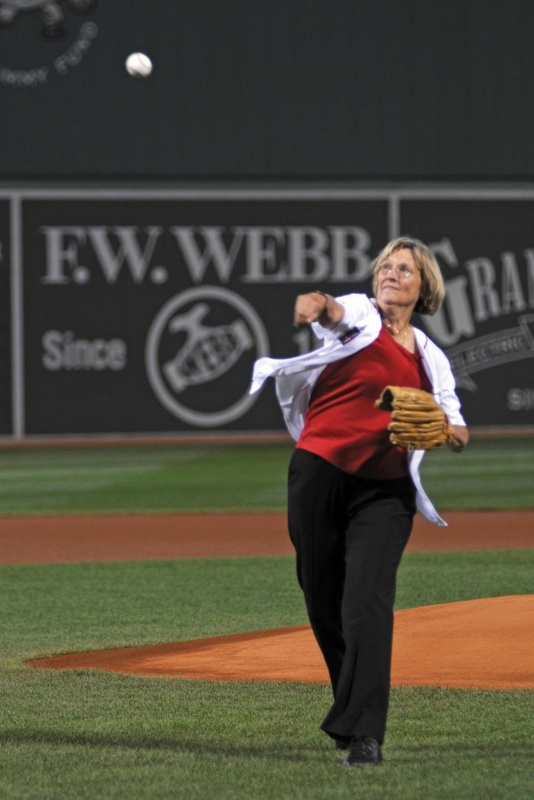 University President Drew G. Faust threw the opening pitch at Fenway Park last night. Before Faust stepped on the field, Harvard athletes that won national championships last year were recognized for their accomplishments in front of the packed stadium. High and outside—that is where University President Drew G. Faust put the ball when she threw out the opening pitch at Fenway Park last night. Dressed in a Red Sox jersey with the number 28—in reference to her being the twenty-eighth University president—Faust threw an arching pitch that crossed the plate in admirable fashion. So how did it feel to throw out the first pitch? “Exciting,” Faust said. “Terrifying,” she quickly added with more emphasis, still shaking a bit from the experience. On a balmy night at Fenway, Harvard dominated the pre-game ceremonies. The national champion women’s squash team took the field to be honored along with three individual champions: wrestler J.P. O’Connor ’10, squash player Colin R. West ’10, and fencer Caroline N. Vloka ’12, as well as recently crowned Miss Massachusetts Loren Galler Rabinowitz ’10. The Kuumba Singers of Harvard College delivered a stirring rendition of the national anthem that drew a round of enthusiastic applause. Harvard students filled the upper sections of Fenway’s first base grandstand, sitting in seats donated by an alumnus. More than 800 students entered the Harvard Alumni Association’s lottery for tickets, with about 200 students winning two tickets each. For Jessica N. Buck ’12, who spent several years living in Indonesia, yesterday’s outing to Fenway was her first time to a baseball game. While she said Fenway lived up to its mythic reputation, the game experience was not quite what she had expected. But just as she said this, Red Sox designated hitter David Ortiz smacked a three-run home run to right field, which at least temporarily upped the excitement level. Regardless of the game’s pace, last night brought Harvard students to one of Boston’s most iconic and historic landmarks—a point Boston residents never cease to emphasize to baseball fans with other loyalties. Kristen E. Simmons ’14, an Astros fan from Houston who used to watch her team play at Minute Maid Park, could only agree. But history is not always a good thing. Anne Carroll Ingersoll ’12, a six-foot-two volleyball player, said she felt a little cramped in the peeling wooden seats.